Fledgling label Love & Other’s second release comes from a pair of accomplished Glaswegian DJ/producers who really are on a bit of a roll just now. 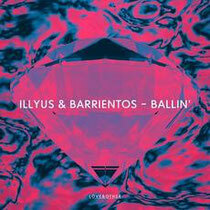 Falling on from their massive 'Do Anything You Wanna’ release on Glasgow Underground, Illyus & Barrientos return with their new ‘Ballin’ EP. An unlikely pair, Illyus, originally a hip-hop DJ known for his turntablism, and Barrientos, a classical music enthusiast; the duo’s paths seemed fated to cross. Individually, they have already achieved support from a cross-section of DJs, including Giles Peterson, Groove Armada, John Digweed and Sasha. Support for their first collaboration EP on Glasgow Underground included Pete Tong, Skream, Gorgon City, Amine Edge, Kry Wolf and loads more. This release, which includes the tracks ‘Ballin’ and ‘Someone Else’, is two slices of bass driven house with more than a touch of class. The EP’s out now on Beatport, check it out below.